"HOT" written in the sand. Someone left this information in the sand with some purpose. To creation science, it is information (God's word) that underlies the fine-tuning of the universe. Furthermore, the existence of biological information inside every cell (DNA and RNA) provides what is perhaps the most powerful argument for intelligent design. William Dembski asserts that DNA possesses specified complexity (i.e., it is both complex and specified, simultaneously) and therefore it must have been produced by an intelligent cause (i.e., that it was designed), rather than being the result of natural processes. One of the main objections to evolution is the origin of the enormous amounts of genetic information content that is needed for an organism to evolve from microbes to humans. Not only has no credible source been identified where information could be produced by natural processes, but in contrast the adaptation of living organism involves a reduction of the information in the genome through natural selection. The word "information" is used in many ways. We mentioned the lay person's sense above, but it is also used of a sequence of symbols (such as letters of a language (see picture at right), dots and dashes of Morse code, or the arrangement of the bumps of Braille) that convey meaning. Another way the term is used is in communications theory, and compression of messages. It is mainly the last two of those senses that are discussed in this article. Royal Truman, in his analysis published in the Journal of Creation discusses two families of approaches: The one derived from Shannon's work and the other derived from Gitt's work. Truman also mention the algorithm definition of information, developed by Solomonoff, Kolmogorov and with contributions from Gregory Chaitin but that has not been discussed in his article. According to Stephen Meyer, scientists usually distinguish two basic types of information: meaningful or functional information and so-called Shannon information (named after Claude Shannon, who developed statistical information theory). Shannon information is really not the same thing as meaningful information. Meaningful information, encoded into a language, can be measured statistically, per Shannon, but the measure is of the redundancy of the symbols, the so-called Shannon entropy,[note 2] not a measure of the "information content", or meaning. Shannon, for example, can be uses to measure the "information content" of a set of random symbols that have no meaning. A clear definition of the concept of “information” cannot be found in information theory textbooks. Gibbs proposes in this context a simple definition: “Information (I) is the amount of the data after data compression”. To Shannon, the semantic aspects of communication are irrelevant to the engineering problem and the significant aspect is that the actual message is one picked from a set of possible messages. According to J. Z. Young, the concept of information in a system, to Shannon, may be defined as that feature of it which remains invariant under re-coding. Both Information theory and semiotics study information but because of its strictly quantitative approach, information theory has a more limited scope. In semiotics, the concept of information is related to signs. A sign is something that can be interpreted as having a meaning, other than itself, and therefore a vehicle of information to one able to decode this signal. Signs can be regarded in terms of inter-dependent levels: pragmatics, semantics, syntax, and empiric. 1 Statistics Transmitted signal Received signal At the statistical level, the meaning is completely ignored. At this level, information exclusively concerns the statistical properties of sequences of symbols. 2 Syntax Used code Comprehended code At the syntactical level, lexical and syntactic aspects are taken in account. Information concerns all structural properties of the process of information creation, the actual sets of symbols and the rules of syntax. 3 Semantics Communicated ideas Comprehended meaning At the semantic level, meaning is taken in account. Information concerns the meaning of the piece of information been transmitted. Every piece of information leads to a mental source, the mind of the sender. 4 Pragmatics Expected action Implemented action At the pragmatic level, how transmitted information is used in practice is taken into account. Information always entails a pragmatic aspect. Information is able to cause the recipient to take some action. Pragmatics also encompasses the contribution of the context to meaning. 5 Apobetics[note 4] Intended purpose Achieved result At the apobetic level, the purpose the sender has with the transmitted information is taken in account. Every bit of information is intentional. At this level we take into account what the information transmitted indicates and implies. According Dr. Gitt, there is no known law through which matter can give rise to information. In his article on scientific laws of information, published in the Journal of Creation, Dr. Gitt states that information is not a property of matter, it is a non-material entity so its origin is in the same way not explicable by material processes. Dr. Gitt also points out that the most important prerequisite for the production of information is the sender's own will, so that information can arises only through will encompassing intention and purpose. Gitt also points out that as information is neither formed of matter (although it can be carried on matter) nor energy, it constitutes a third fundamental quantity of the universe. It is generally accepted that the meaning of information given by Claude Shannon in his theory of mathematical information is relevant and legitimate in many areas of biology but in recent decades, and even before, many biologists have applied informational concepts in a broader sense. They see most basic processes characteristic of living organisms being understood in terms of the expression of information, the execution of programs, and the interpretation of codes. John von Neumann stated that the genes themselves are clearly parts of a digital system of components. Many biologists, especially materialists, see this trend as a having foundational problems. The intelligent design concept that DNA exhibited specified complexity was developed by mathematician and philosopher William Dembski. Dembski claims that when something exhibits specified complexity (i.e., is both complex and specified, simultaneously) one can infer that it was produced by an intelligent cause (i.e., that it was designed), rather than being the result of natural processes (see naturalism). He provides the following examples: "A single letter of the alphabet is specified without being complex. A long sentence of random letters is complex without being specified. A Shakespearean sonnet is both complex and specified." He states that details of living things can be similarly characterized, especially the "patterns" of molecular sequences in functional biological molecules such as DNA. Dembski defines a probability of 1 in 10150 as the "universal probability bound". Its value corresponds to the inverse of the upper limit of "the total number of possible specified events throughout cosmic history," as calculated by Dembski. He defines complex specified information (CSI) as specified information with a probability less than this limit. (The terms "specified complexity" and "complex specified information" are used interchangeably.) He argues that CSI cannot be generated by the only known natural mechanisms of physical law and chance, or by their combination. He argues that this is so because laws can only shift around or lose information, but do not produce it, and chance can produce complex unspecified information, or non-complex specified information, but not CSI; he provides a mathematical analysis that he asserts demonstrates that law and chance working together cannot generate CSI, either. Dembski and other proponents of ID contend that CSI is best explained as being due to an intelligent cause and is therefore a reliable indicator of design. “ Life is still as special as it ever was, because it resides not in the chemical media but in the information stored on the chemical media. David Salomon states: "Information seems to be one of those entities that cannot be precisely defined, cannot be quantified, and cannot be dealt rigorously". Salomon went on to say, however, that in the field of information theory, information can be treated quantitatively. where P(A) is the probability that the event A will occur and b is the chosen base of the log. If the unit of information is bits, we use b=2 and so on. The measurement of information, in mathematical terms, has to consider the number of signals, their probability, and combinatorial restrictions. The amount of information transmitted by a signal increases the more it is their rarity, and the more frequent is a signal, less information it transmits. It's worth noting that while we can quantify the probability of any given symbol, we can use no absolute number for the information content of a given message. Similarly to the previous case (Shannon), the Kolmogorov complexity can't measure the meaning of information. In fact, it measures the compressibility of a given sequence. 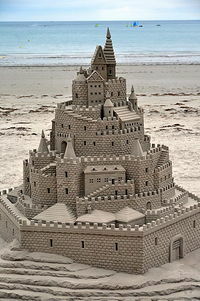 A very impressive sand castle on the beach near St Helier in Jersey. Wilder-Smith establishes a distinction between actual and potential information. The former can never be synthesized by stochastic processes, while the latter might be. He establishes a comparison between actual information and negentropy[note 6] and, on the other side, a correspondence between potential information and entropy. Wilder-Smith proposes a simple example that clarifies the distinction between potential and actual information. The potential to make pictures out of a large amount of randomly distributed dots is infinite although a set of randomly distributed dots will not show in reality an image that looks like something (e.g., a bicycle). The points randomly distributed do possess the capacity for endless amounts of information, but do not communicate any by themselves, so, indeed, there's no actual information. Lester and Bohlin also agree with Wilder-Smith. They point out that several authors in recent years have established a connection between the genetic code present in DNA and information theory. The overall conclusion of their studies is that information cannot arise spontaneously by mechanistic processes. Due to the enormous odds against abiogenesis on earth some scientists have turned to the panspermia hypothesis, the belief that life started off this planet. Among these scientists are Francis Crick, Fred Hoyle, Svante Arrhenius, Leslie Orgel and Thomas Gold. According to Jonathan Sarfati, the main scientific objection to evolution is not whether changes, whatever their extent, occur through time. The key issue is the origin of the enormous amount of genetic that is needed in order for a microbe to evolve, ultimately reaching the complexity of humans. Dr. Lee Spetner points out that in living organisms, adaptation often take place by reducing the information in the genome and notes that the vertebrate eye or its immune system could never have evolved by loss of information alone. Biological information is prescriptive, as illustrated by the understanding that genetic information defines biological processes and the systems of which they are part. Likewise, minds are prescriptive and impart meaning to matter and not the other way around. Furthermore, mental processes and their abstract products cannot be physically measured and are therefore are not comprised of or a property of matter. Because prescriptive information is always traceable to an intelligent source, it follows that it is a non-physical product of a non-physical mind. This is illustrated by the understanding that information is not bound to whatever medium onto which it is encoded, since information can be shared without translocation it's material medium. If information were comprised of or a property of matter, it would not be possible to convey information without translocation of the material medium upon which it is encoded. For example, it is possible to share the information that is encoded in a book without moving any of the matter that comprises the book - a book can be read aloud and it's information shared with a listener, yet none of the matter of the book is transferred to the listener. This analogy provides a clear understanding that the information which defines living systems is a product of intelligence, and not a product of material processes. Since evolution theory is based upon the material processes of chemistry (as with Abiogenesis) and biochemistry (as with Evolution Theory), evolution therefore cannot account for the information which defines living systems, and we have profound evidence that a mind of astonishing intelligence is the origin of the prescriptive information that defines living systems and the nano-technology the cell. ↑ Dr. Imre Simon, who made this reference, was a well-known Hungarian-born Brazilian mathematician and computer scientist. ↑ Shannon entropy is the average unpredictability in a random variable, which is equivalent to its information content. ↑ Dr. Valdemar W.Setzer is a well-known Brazilian computer scientist. He is is a signatory to the list named "A Scientific Dissent From Darwinism". Found in: "A Scientific Dissent from Darwinism (List)". http://www.discovery.org/scripts/viewDB/filesDB-download.php?command=download&id=660. Retrieved July 31, 2013. ↑ The term "apobetics" was introduced by Dr. Werner Gitt in 1981 to express the teleological aspect of information, the question of purpose. The word is derived from the Greek: αποβαίνων, apobeinon that means result, success, conclusion, consequence. Found in Gitt, Werner (2005). In the Beginning was Information: A Scientist Explains the Incredible Design in Nature. Green Forest, AR: Master Books. p. 77. ISBN 978-0-89051-461-0. ↑ The Eigen's book quoted by Dembski is Eigen, Manfred (1992). Steps Towards Life: A Perspective on Evolution. Oxford: Oxford University Press. p. 12. ISBN 0-19854751-X. ↑ Negentropy, also negative entropy or syntropy of a living system is the entropy that it exports to keep its own entropy low. ↑ Sir Fred Hoyle and Chandra Wickramasinghe calculated the probability of appearance of the different enzymes forming in one place at one time to produce a single bacterium in 1 in 1040,000. Hubert Yockey calculated the probability for the appearance of the iso-l-cytochrome c at random as being 2 x 10-44. Walter L. Bradley and Charles B. Thaxton calculated the probability of a random formation of amino acids into a protein as being 4.9 x 10-191. Harold Morrison obtained in his calculations the impressive number of 1 in 10100,000,000,000 for a single celled bacterium to develop from accidental or chance processes. As quoted by Overman in the book: Overman, Dean L (1997). A Case Against Accident and Self-Organization. Lanham: Rowman & Littlefield Publishers. p. 33-102. ISBN 0-8476-8966-2. ↑ Simon, Imre. "MAC 333 - A Revolução Digital e a Sociedade do Conhecimento - Tema 11 - O que é Informação? Como ela age? [MAC 333 - The Digital Revolution and the Knowledge Society - Track 11 - What is Information? How it works?]". http://www.ime.usp.br/~is/ddt/mac333/aulas/tema-11-24mai99.html. Retrieved July 31, 2013. ↑ 2.0 2.1 2.2 Dembski, William A. Intelligent Design as a Theory of Information Access Research Network, November 15 1998. ↑ Sarfati, Jonathan (2010). The Greatest Hoax on Earth? :Refuting Dawkins on Evolution. Atlanta, Georgia: Creation Book Publishers. p. 43. ISBN 978-0-949906-73-1. ↑ Spetner, Lee M (1998). "5-Can Random Variation Build Information?". Not by Chance!. Brooklyn, New York: The Judaica Press. p. 127-160. ISBN 1-880582-24-4. ↑ 5.0 5.1 Truman, Royal (2012). "Information Theory-Part 1:Overview of Key Ideas". Journal of Creation 26 (3): 101-106. ISSN 1036-2916. ↑ Meyer, Stephen C (2013). Darwin's Doubt: The Explosive Origin of Animal Life and the Case for Intelligent Design. Seattle, WA: HarperOne. p. 164-168. ISBN 978-0-06-207147-7. ↑ M. Buckland. (Spring 1997). ""Information" and Other Words". School of Information Management & Systems. http://www2.sims.berkeley.edu/courses/is101/s97/infoword.html. Retrieved July 31, 2013. ↑ Lindsay, Robert K (1995). "Inferential Memory as the Basis of Machines Which Understand Natural Language". In Feigenbaum, Edward A.; Feldman, Julian. Computers & Thought. Menlo park, Cambridge, London: AAAI Press/The MIT Press. p. 218. ISBN 0-262-56092-5. ↑ Losee, Robert M. (1997). "A Discipline Independent Definition of Information". Journal of the American Society for Information Science 48 (3): 254–269. ISSN 1532-2890. http://www.idt.mdh.se/~gdc/work/ARTICLES/09-VDM-BOOK/pdf/DisciplineIndependentDefinitionOfInformation.pdf. ↑ 10.0 10.1 10.2 10.3 Nöth, Winfried (1995). Handbook of Semiotics. Indiana: Indiana University Press. ISBN 0-253-20959-5. ↑ Kurzweil, Ray (2000). The Age of Spiritual Machines: When Computers Exceed Human Intelligence. New York: Penguin Books. p. 30. ISBN 0-14-028202-5. ↑ Barlow, John Perry. "The Economy of Ideas: A framework for patents and copyrights in the Digital Age. (Everything you know about intellectual property is wrong.)". http://www.wired.com/wired/archive/2.03/economy.ideas_pr.html. Retrieved July 31, 2013. ↑ 13.0 13.1 Setzer, Valdemar W.. "Data, Information, Knowledge and Competence". http://www.ime.usp.br/~vwsetzer/data-info.html. Retrieved July 31, 2013. ↑ "Information". Wikipedia. http://en.wikipedia.org/wiki/Information. Retrieved July 31, 2013. ↑ Wiener, Norbert (1948). A Cybernetics; or, Control and Communication in the Animal and the Machine, 2nd edition. pp. 132. https://libraries.mit.edu/150books/2011/04/04/1948/. ↑ 16.0 16.1 Lin, Shu-Kun (2008). "Gibbs Paradox and the Concepts of Information, Symmetry, Similarity and Their Relationship". Entropy 10 (1): 1-5. http://www.mdpi.com/1099-4300/10/1/1. ↑ Shannon, Claude E.; Weaver, Warren (1949). The Mathematical Theory of Communication. Illinois: Illini Books. p. 1. Library of Congress Catalog Card nº 49-11922. http://cm.bell-labs.com/cm/ms/what/shannonday/shannon1948.pdf. ↑ Young, J. Z (1963). "Memory, Heredity and Information". In Huxley, Julian; Hardy, A. C.; Ford, E. B. Evolution as a Process (2nd ed.). New York, N. Y.: Collier Books. p. 326-346. ↑ 19.0 19.1 19.2 19.3 19.4 19.5 19.6 Gitt, Werner (2005). In the Beginning was Information: A Scientist Explains the Incredible Design in Nature. Green Forest, AR: Master Books. p. 49-87. ISBN 978-0-89051-461-0. ↑ 20.0 20.1 Gitt, Werner (2009). "Scientific Laws of Information and Their Implications-Part 1". Journal of Creation 23 (2): 96-102. ISSN 1036-2916. ↑ 21.0 21.1 "Biological Information". Stanford Encyclopedia of Philosophy. Oct 4, 2007. http://plato.stanford.edu/entries/information-biological/. Retrieved August 2, 2013. ↑ von Neumann, John (2000). The Computer and the Brain (2nd ed.). New Haven and London: Yale University Press. p. 69. ISBN 0-300-08473-0. ↑ Chaitin, Gregory (2005). Meta Math! : The Quest for Omega. New York: Vintage Books. p. 66-74. ISBN 978-1-4000-7797-7. http://arxiv.org/pdf/math/0404335.pdf. ↑ 24.0 24.1 Dembski, William A.; Witt, Jonathan (2010). Intelligent Design Uncensored: An Easy-to-Understand Guide to the Controversy. Downers Grove, Illinois: InterVarsity Press. p. 72-73. ISBN 978-0-8308-3742-7. ↑ Davis, Percival; Kenyon, Dean H. Of Pandas and People: The Central Question of Biological Origins (2nd ed.). Dallas, Texas: Haughton Publishing Company. p. 64. ISBN 0-914513-40-0. ↑ Dawkins, Richard (1995). River Out of Eden. New York: Basic Books. p. 4. ISBN 978-0-465-06990-3. ↑ Meyer, Stephen C (2006). "12-The Origin of Biological Information and the Higher Taxonomic Categories". In Dembski, William A. Darwin's Nemesis: Philip Johnson and the Intelligent Design Movement. Downers Grove, IL: Inter-Varsity Press. p. 178-179. ISBN 978-0-8308-2836-4. ↑ Berlinski, David (2010). The Deniable Darwin and Other Essays. Seattle: Discovery Institute Press. p. 153. ISBN 978-0-979014-12-3. ↑ Dembski, William A.Explaining Specified Complexity Appeared as Metaviews 139 (www.meta-list.org). September 13 1999. ↑ Andrews, Edgar (2009). Who Created God?. Carlisle: EP Books. ISBN 978-0-85234-707-2. ↑ 32.0 32.1 Salomon, David (2005). Coding for Data and Computer Communications. New York: Springer. p. 59. ISBN 0-387-21245-0. ↑ Salomon, David (2000). Data Compression: The Complete Reference (2nd ed.). New York: Springer. p. 279. ISBN 0-387-95045-1. ↑ 34.0 34.1 Sayood, Khalid (2000). Introduction to Data Compression (2nd ed.). San Francisco: Morgan Kaufmann Publishers. p. 13-14. ISBN 1-55860-558-4. ↑ Nelson, Mark; Gailly, Jean-Loup (1996). The Data Compression Book (2nd ed.). New York: M&T Books. p. 14. ISBN 1-55851-434-1. ↑ 36.0 36.1 Sipser, Michael (1997). Introduction to the Theory of Computation. Boston: PWS Publishing Company. p. 214-215. ISBN 0-534-94728-X. ↑ Knuth, Donald (1981). The Art of Computer Programming: Seminumerical Algorithms. 2 (2nd ed.). Reading, Massachusetts: Addison-Wesley Publishing Company. p. 163-166. ISBN 0-201-03822-6. ↑ Dewdney, A. K (1993). "8-Random Numbers: The Chaitin-Kolmogoroff Theory". The New Turing Omnibus: 66 Excursions in Computer Science. New York: A. W. H. Freeman/Owl Books. p. 49-55. ISBN 978-0-8050-7166-5. ↑ 39.0 39.1 39.2 39.3 Wilder-Smith, A. E. (1987). The Scientific Alternative to Neo-Darwinian Evolutionary Theory. Costa Mesa, California: The Word For Today Publishers. p. 23-51. ISBN 0-936728-1B. ↑ Dembski, William A (1999). Intelligent Design:The Bridge Between Science & Theology. Downers Grove, Illinois: IVP Academic. p. 153-183. ISBN 0-8308-2314-X. ↑ Lester, Lane P; Bohlin, Raymond G (1989). The Natural Limits to Biological Change (2nd ed.). Dallas: Probe Books. p. 157. ISBN 0-945241-06-2. ↑ 42.0 42.1 42.2 42.3 42.4 Overman, Dean L (1997). A Case Against Accident and Self-Organization. Lanham: Rowman & Littlefield Publishers. p. 33-102. ISBN 0-8476-8966-2. ↑ Denton, Michael (1985). Evolution: A Theory in Crisis. Chevy Chase, MD: Adler & Adler. p. 271. ISBN 0-917561-52-X. ↑ Shapiro, Robert (1987). Origins: A Skeptic´s Guide to the Creation of Life on Earth. Toronto: Bantam Books. p. 226-227. ISBN 0-553-34355-6. ↑ Egnor, Michael (November 26, 2008). ""The Mind and Materialist Superstition". Evolution News. https://evolutionnews.org/2008/11/the_mind_and_materialist_super/. Lin, Shu-Kun (2008). "Gibbs Paradox and the Concepts of Information, Symmetry, Similarity and Their Relationship". Entropy 10 (1): 1-5. http://www.mdpi.com/1099-4300/10/1/1. Floridi, Luciano (2005). "Is Information Meaningful Data?". Philosophy and Phenomenological Research 70 (2): 351–370. http://philsci-archive.pitt.edu/archive/00002536/01/iimd.pdf. Information as a Verb: Re-conceptualizing Information for Cognitive and Ecological Models by David G. Casagrande. Information at A Storehouse of Knowledge. This page was last modified on 13 April 2019, at 18:37.